Mike Taylor, Director of Operations for Grace Brethren International Missions in Winona Lake, Indiana, announces the appointment of Jim Folsom (at right, with his family) as the new communications officer for GBIM. Folsom recently completed ten years as Director of Communications for the Wendell Whitman Companies in Winona Lake. 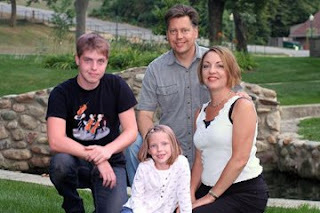 He and his wife Stephanie, son Jason age 19, and daughter Deanna age 7 are pictured here. Originally from the Yakima, Washington, Grace Brethren Church, Folsom is a graduate of Grace College and holds the M.Div. from Grace Theological Seminary. He has had prior communication experience with CE National and with the former church-planting arm of the FGBC, Brethren Home Missions Council. For the past several years he has also moonlighted with the Brethren Missionary Herald Co. as a graphic designer and typesetter for BMH Books and related products. Folsom will be a welcome member of the “Dream Team,” the communications officers from all the Grace Brethren national organizations, who meet monthly in the BMH conference room to share resources, communicate the latest progress in their organizations, and to fellowship together.